A relatively recent addition to the stem cell family and holding promise as an easily obtained source of adult stem cells, dental pulp stem cells (DPSCs) were discovered at the beginning of this decade (Gronthos et al., 2000). DPSCs, also known as SHED cells (stem cells harvested from exfoliated deciduous teeth (Miura et al., 2003)), are one of the few discovered stem cells available from a naturally molted human tissue. Dental pulp, which is living tissue at the center of the tooth made up of cells called “odontoblasts,” contains the aptly-named DPSCs. DPSCs were originally identified as being able to produce odontoblast-like cells as well as a tissue similar to dentin, which normally surrounds and protects the dental pulp (Gronthos et al., 2000; 2002). Although these studies found DPSCs able to produce two of the primary components of teeth, pulp and dentin, studies have not reported that DPSCs are able to create the other two factors, which are enamel and cementum (Cate, 1998). In addition to dental pulp and dentin, DPSCs are able to differentiate into a wide variety of other cell and tissue types including neural cells, adipocytes, osteoblasts, chondrocytes, and striated muscle (Gronthos et al., 2002; Miura et al., 2003; Stevens et al., 2008). Recent evidence suggests that although DPSCs are thought to be mesenchymal stem cells, as they share many properties with mesenchymal stem cells, the DPSC cultures also contain multipotent neural crest stem cells (NCSC), shown by their ability to differentiate into neural crest-derived (non-mesencyhmal) melanocytes, in addition to displaying other NCSC traits (Stevens et al., 2008). Because they can be obtained in a completely noninvasive manner, and have relatively broad differentiation capabilities, DPSCs may offer significant contributions to the field of regenerative medicine (d’Aquino et al., 2008; Sloan et al., 2009), though much characterization is still desired. Cate, A. R. Ten. Oral Histology: Development, Structure, and Function. Toronto: Mosby-Year Book, 1998. ISBN 0-8151-2952-1.
d’Aquino, R., Papaccio, G., Laino, G., and Graziano, A. Dental Pulp Stem Cells: A Promising Tool for Bone Regeneration. Stem Cell Rev. and Rep. 2008. 4(1): 21-6. Gronthos, S., Mankani, M., Brahim, J., Robey, P. Gehron, and Shi, S. Postnatal human dental pulp stem cells (DPSCs) in vitro and in vivo. PNAS. 2000. 97: 13625-30. Gronthos, S., Brahim, J., Li, W., Fisher, L., Cherman, N., Boyde, A., DenBesten, P., Robey, P. Gehron and Shi, S. Stem Cell Properties of Human Dental Pulp Stem Cells. J. Dent. Res. 2002. 81(8): 531-5. Miura, M., Gronthos, S., Zhao, M., Lu, B., Fisher, L., Robey, P. Gehron, and Shi., S. SHED: Stem cells from human exfoliated deciduous teeth. PNAS. 2003. 100: 5807-12. Sloan, A. J., Waddington, R. J. 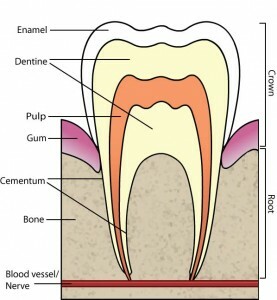 Dental Pulp Stem Cells: What, Where, How? Internat. J. Paed. Dent. 2009. 19(1): 61-70. Stevens, A., Zuliani, T., Olejnik, C., LeRoy, H., Obriot, H., Kerr-Conte, J., Formstecher, P., Bailliez, Y., and Polakowska, R. Human dental pulp stem cells differentiate into neural crest-derived melanocytes and have label-retaining and sphere-forming abilities. Stem Cells and Dev. 2008. 17(6): 1175-84. Original “Tooth Structure” image from the Wikimedia Commons and modified and redistributed according to the terms of the Free Art License. admin	Dental Pulp Stem Cells	adult, history, mesenchymal, neural crest, news, regenerative medicine	© 2009-2010, Teisha Rowland. All rights reserved.